That looks quite interesting - havin' Guild Sonbirds and a solid-body electric - the combination has always intrigued - besides i have played some Telecasters and never acquired taste for them - but this seems different - who knows . . . I've heard a few demo clips from it, and it all sounds incredibly underwhelming to my ears. Its all very artificial sounding. The acoustic settings don't sound like a good acoustic, and the electric settings don't sound like a good electric. A typical modeling guitar like we've seen before. It may do well as a stage acoustic, but not 2 grand worth. 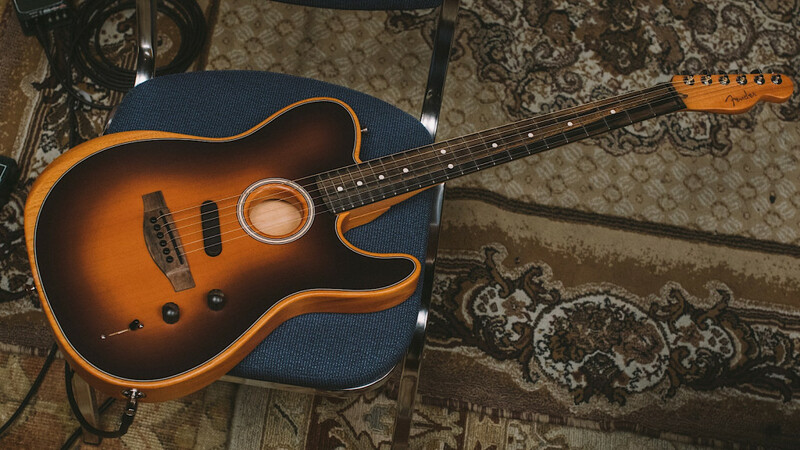 The Fender model from this year's NAMM that interests me is the Electric XII reissue. Unfortunately they've "improved" the pickups. But…Curtis Novak to the rescue: https://www.curtisnovak.com/shop/xii-v/. So I just might give it a spin. Cool video, Ralf. A very cool collaboration! Its all very artificial sounding. Last edited by SFIV1967; 01-29-2019 at 09:14 PM. I'm going to give a tangential "ooh" and "aah" on those striped ebony fretboards, which I'm sure are now easy to get through Taylor's efforts in Cameroon. To be clear, I think they're awesome! 20 minutes in when he runs a loop on the acoustic sound and then switches to the electric settings to solo over it is just remarkable. Very, very cool. I'm not much of a leccie, but that is quite brilliant. Nathaniel Murphy is an amazing player. And he makes a lot of guitars sound good. That said, I've seen him do some of this stuff on archtops, and they don't have the clear sounds (I'm speaking especially of the harmonics and percussion). I honestly think he sounds better on this than anything else I've seen him play. Overall, I think it has a pretty good sound, actually. I don't care for the modeling. But I like the one that mixes the "3D pickup" that gets the Z-Axis of the top. I think that has some very interesting sounds, and picks up the percussion well. The full out Tele doesn't sound exactly like a tele, but it's in the ball park. I could see this as being a real nice guitar to take to an open mic night. All that said... $2000 is just too much. At least for me. If it were half of that I'd be seriously tempted because it fits so many places. But I just couldn't see dropping $2000 on it personally. Still, nice to see fender trying new things. Last edited by PittPastor; 01-30-2019 at 08:31 PM. Considering a Guild F65ce listed for $2295.00 in '01, that sounds pretty reasonable to me in inflation-adjusted dollars.